Thank you for the great tips on keeping in touch with clients. Business get so busy at times and we forget to thank or follow-up with previous clients. What kind of drip marketing campaign site do you recommend? Make sure your holiday emails are regionally appropriate. Most of the world is outside the USA. Also find international holidays that align with your brand, do some research and position your brand. Or sending happy thanksgiving messages to anyone outside the USA. And not sending material for international holidays you don’t understand, and losing customers because of it. 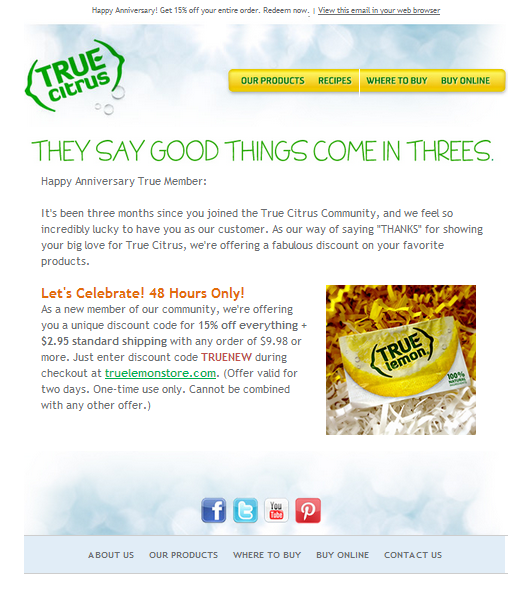 In regards to the anniversary emails, we really need the ability to do drip campaigns through VR… please! The anniversary e-mail is a pretty good idea. I’m working an app developer. one of the issues we deal with is that people download something, use it twice and forget it. A friendly reminder might just get them to become active again.